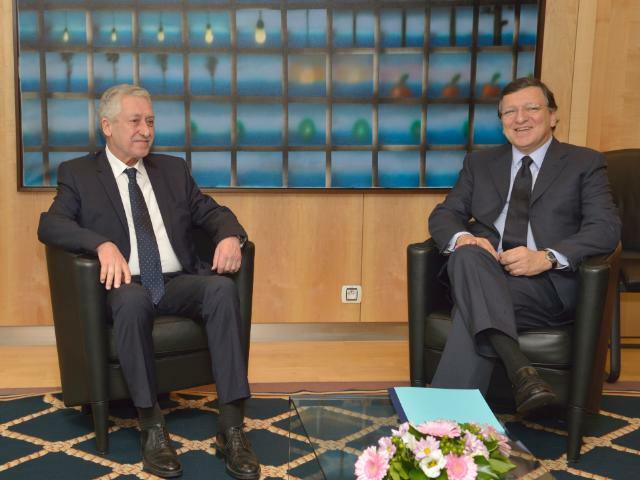 Meeting European Commission President Jose Manuel Barroso in Brussels on Tuesday, Greek coalition government partner Fotis Kouvelis, leader of the Democratic Left (DIM.AR) party, stressed the need for immediate measures to halt the recession and unemployment in Greece. In statements as he left the meeting with Barroso at the European Commission, Kouvelis said he’d expressed DIM.AR’s opposition to “the austerity policies destroying society and undermining the prospects of an exit from the economic crisis”. The party leader stressed that the only answer to the recession was to take immediate measures to kickstart the growth process. Democratic Left (DIM.AR) leader Fotis Kouvelis, a junior partner in the coalition government in Greece, expressed his party’s opposition to “the austerity policies that downgrade the social state” in a meeting he had here on Wednesday with European Commissioner Laszlo Andor, responsible for employment, social affairs and inclusion. After the meeting, Kouvelis said that he underlined the need for the adoption of extraordinary measures in support of Greece aimed at relieving the unemployed and supporting those living in conditions of deep poverty. He suggested the introduction of immediate intervention in support of households that have no employed members, in combination with programmes designed to support the young. He said that more than 400,000 families were in this category, adding that measures to support the unemployed over 55 with obsolete qualifications are also necessary. 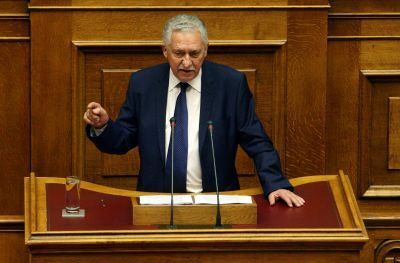 Progressive and pro-European powers must be strengthened in the coming European elections of 2014, Democratic Left (DIM.AR) leader Fotis Kouvelis said in Brussels on Wednesday, following a meeting with European Parliament President Martin Schulz. 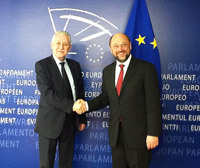 Schulz is also a member and former chair of the Group of the Progressive Alliance of Socialists and Democrats in the European Parliament. Kouvelis called for changes in European policies dealing with the crisis and said his party supported the speeding up of economic and political unifiation in the EU. 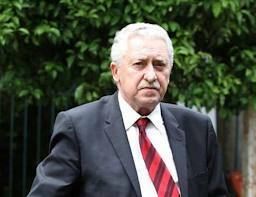 “Ethnocentrism and state hegemonies will lead the process of unification to a dead end,” he warned. Kouvelis added there must be immediate implementation of the arrangements concerning VAT reduction in catering, increase of the number of doses for the debts of citizens towards the State, effective relief for households to repay loans by increasing the number of doses, lower interest rates and partial cut of the debt as well as a review and redefinition of the total price of heating oil. Fotis Kouvelis who heads Democratic Left, the junior partner in the tripartite coalition, on Friday underlined his opposition to layoffs in the civil service, responding to criticism by a senior European Commission official about his party’s resistance to cutbacks in Greece’s public sector. “A dogmatic insistence on layoffs is out of place and out of time,» Kouvelis said, noting that a plan that has been drawn up by the Administrative Reform Ministry will reduce the number of civil servants in Greece to below the European Union average. Η υπό εξαφάνιση μεσαία τάξη της Ελλάδας είναι ένα από τα πέντε δημοφιλέστερα τηλεοπτικά ρεπορτάζ στο διαδικτυακό τόπο του CNN με εκατομμύρια επισκέψεις από τις 25 Σεπτεμβρίου 2012, που αναρτήθηκε για πρώτη φορά. Νεόπτωχοι και άνεργοι στη θέση εργαζομένων και αστών συνθέτουν τον «κορμό» του ρεπορτάζ που ακολουθεί πρώην εργαζόμενους και ευκατάστατους Έλληνες στο σημερινό τους αδιέξοδο της ανεργίας και της ανέχειας.